Today is the day in the new year when many of us return to our work, having celebrated the time out of time that stretches variously from Yule to Epiphany, which falls just at the Twelfth Day of Christmas. These twelve days are figured a bit differently depending on your church or your folk way, and some count it from the winter solstice to the first day of the new year. I have found over the years that I like the twelve days to begin on December 26 as was done in medieval times, thus ending on January 6. This brings us to Plough Monday, and St. Distaff’s Day, and even Copperman’s Day, all meant to honor the return to our daily life as we begin to put away Christmas. As is often the case, friend John Cutrone puts it all beautifully over at the Convivio Book of Days blog, well worth a visit! I love the idea of blessing the tools of my trade, so this year I created this magic more intentionally, gathering my writing tools of every stripe. I included my favorite dip pen, a Speedball C-2, the one I learned with lo! these many years ago using Jacqueline Svaren’s Written Letters, a book my mother gave me for Christmas the year I graduated from college. Little did I know the merry path it would lead me down when I began tracing those lovely letters. 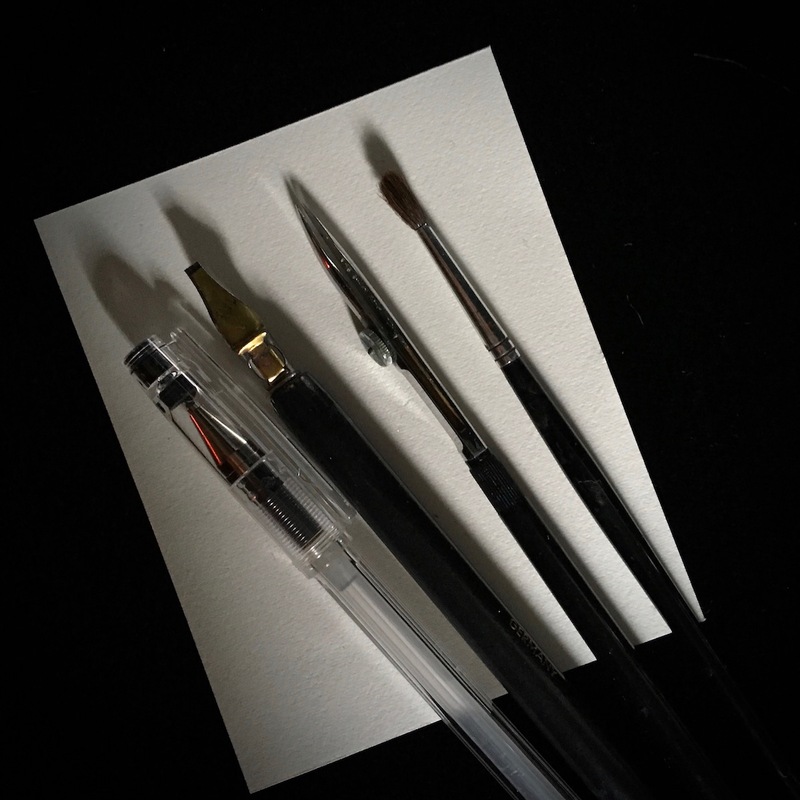 I also brought my ruling pen, which hearkens back to my father’s and grandfather’s drafting tools and which has been indispensable to me in countless ways, and a pedestrian paintbrush, of the many, many that I have. I naively thought when I took up calligraphy that I would only need a pen, some ink and paper; now I have an art studio full of amazing stuff. 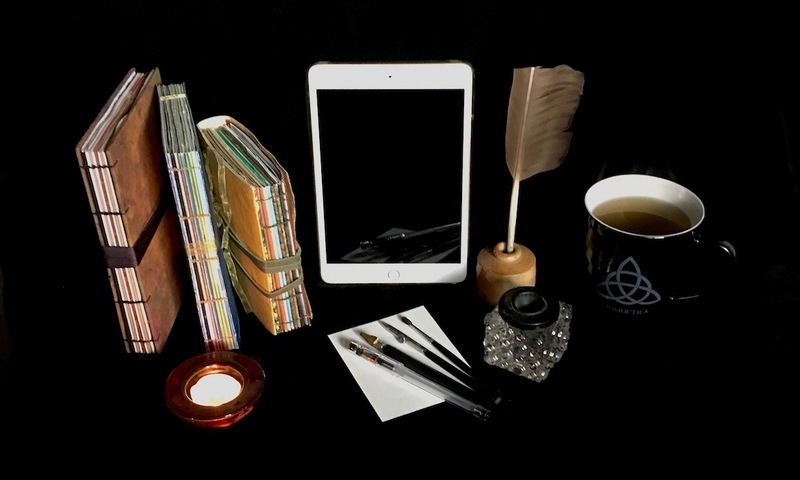 I also gathered up a couple of my favorite inkwells and a quill, a few of my handmade journals, and the indispensable iPad, standing in for all the electronic devices I use in various ways, and here reflecting the old school tools in its shiny black screen. And of course a mug of steaming hot tea, without which I rarely begin any work, including this post. The tool I use most often these days, aside from this keyboard for its access to the editing capabilities of my MacBook Pro, is an ordinary pen. True, it’s a special Pilot Hi-Tec-C pen, which I buy in quantity. I use it not only in my hand sewn journals, but on the loose lined pages I gather in binders for later transcription into the Scrivener writing app. I can compose at the keyboard, but I sometimes prefer the old way of pen on paper for a more direct line between brain, memory and page. I rather like how it lit up with a reflection of the candle flame in this photo, a good omen for my work in progress. There are indeed times when my pen is on fire with inspiration! Bless the work of my mind. Bless the work of my memory. Bless the work of my words. Creator, guard and nourish my work in the world, my writing in all its forms, this year and every year. May it be so. May your work also be blessed, inspired and joyful as we move forward into 2019! I was moved by your beautiful blessing prayer for your tools, Cari. I hope you don’t mind that I shared it on the Florida Letterpress facebook group page. John Cutrone is one of our members. Not at all, Carl. Thanks for doing so, and for your kind words. Happy new year to you and yours as well! Beautiful, it feels like a fresh start, thank you. Wishing you a sweet new year, Laurie. Dear Cari, thank you for your words…always inspiring. I appreciate you, faithful reader. Happy new year, Jacqueline. This is a beautiful practice. Intuitively, I changed my altar (or re-jigged as I am wont to term it) on 7th January, but I do like the idea of blessing the tools of one’s trade – my fountain pen, my penlight pen, ipad and laptop, and reference books! – rhyming dictionary, etymological dictionary and other specialised topic books, too! It felt good to do this, Bee. And it was challenging to narrow down what I would include. For there are many things that feed the writing, including the pillow I sleep on every night while I dream! Ye are most welcome, friend John. And a bountiful new year to you and Seth! Of course I don’t mind, thank you, Michele. You inspire me, Cari. Yes, where would we be without our tools which bring us industry, security, satisfaction, growth, and a way to give back. I shared this on Facebook. Your prayer summarizes Psalm 90 requests and I want to pray it too. Thanks for sharing and praying it.